Dodgers Blue Heaven: Blog Kiosk: 2/27/2015 - Dodger Links - Koufax, Anderson and I See "White and Gold"
Blog Kiosk: 2/27/2015 - Dodger Links - Koufax, Anderson and I See "White and Gold"
It looks like the Dodgers, up and down the entire system, will be eating well from now on. 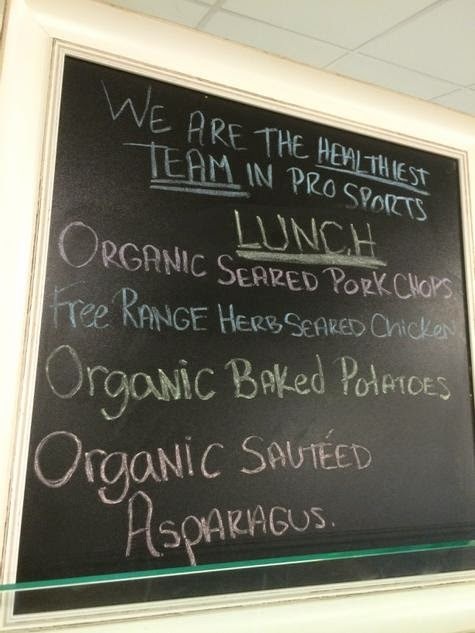 Gabe Kapler, the new Director of Player Development, has brought along his passion for healthy eating and living. From what I understand, ballplayers will now be served meals similar to the menu shown above from Los Angeles to every minor league team in the franchise. BTW, the photo above was tweeted out by Jon Weisman at Dodger insider yesterday afternoon, and it shows that days lunch menu. First real "Dodger" moment having Sandy Koufax have nothing but positive things to say after watching me throw a bullpen. Via Eric Stephen at True Blue LA, "Dodgers confident Joel Peralta will be ready for opening day." Just another example of the kind of wacky things that happen during Spring Training. Apparently the entire Dodger clubhouse was debating the color of that ugly dress that hit the interwebs like a flash flood yesterday. Via Matthew Moreno at Dodgers Nation, "Dodgers, MLB Players Join ‘What Colors Are The Dress?’ Twitter Debate." For the record, i see "white and gold." Following on Ellis' recent retirement, Stacie Wheeler at Lasorda's Lair writes; "Remembering Mark Ellis's Biggest Dodger Moments." Matt F at Heartbreaking Cards of Staggering Genius shares a bunch of fantastic cards and collectibles of former Brooklyn Dodger and Chicago Cub great Andy Pafko. If you are heading over to Arizona for Spring Training you should look out for this. Panini America will be hosting their Second Annual Panini Spring Training Road Trip in late March. Go here for information.